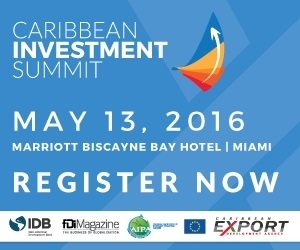 The Inter-American Development Bank (IDB), the Caribbean Association of Investment Promotion Agencies (CAIPA), and the Caribbean Export Development Agency (CEDA) are organizing the Caribbean Investment Summit 2016 to increase foreign direct investment (FDI) by helping investors locate to the Caribbean in order to boost their exports to different markets and make the most of the region's comparative advantages. Government ministers, investment promotion agencies, and potential investors will come together in Miami on May 12 and 13 to discuss a range of policy and program options to enable Caribbean countries to attract FDI and to maximize its impact on economic development and job creation in the context of the current economic downturn. The event will include the Regional Policy Dialogue, where those attending will be able to analyze good international practices, hear opinions from the private sector, and single out a series of actions to implement at the national and regional levels. The meeting will also provide a space for public–private dialogue of the highest level, the Americas Business Dialogue, in order to work with the business community on a shared development agenda for the Caribbean.Some 150 investors are expected to take part, who will be seeking opportunities in the tourism, renewable energies, logistics, and service subcontracting sectors. The summit will also include the award ceremony for the Regional Investor of the Year prize, in recognition of success stories in the Caribbean. The event is co-organized and financed by the IDB as part of the Regional Public Goods Initiative. Companies and the media interested in participating can sign up through ConnectAmericas. The IDB’s mission is to improve lives. Founded in 1959, the IDB is a major source of long-term financing for economic, social, and institutional development in Latin America and the Caribbean. The IDB also carries out cutting-edge research projects and provides policy-related advice, technical assistance, and training to public and private clients throughout the region.